A cubic polynomial is a polynomial of degree 3. An equation involving a cubic polynomial is called a cubic equation and is of the form f(x) = 0. There is also a closed-form solution known as the cubic formula which exists for the solutions of an arbitrary cubic equation. A cubic polynomial is represented by a function of the form. And f(x) = 0 is a cubic equation. The points at which this curve cuts the X-axis are the roots of the equation. This cubic equation has real and unique roots at -8, -10, -20. Roots may be verified using the factor theorem (Check out this tutorial specially example 6). These are also called the "critical" points where the derivative is zero. 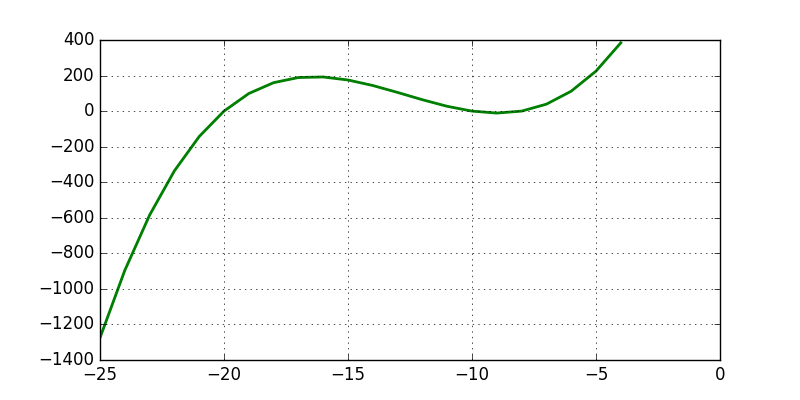 Coming to other geometrical features of this curve: The y-intercept of this curve is at y=1600. And the second derivative of this curve becomes zero at x = -12.67. At this point the curve changes concavity. A cubic curve has point symmetry around the point of inflection or inflexion. The zeroes of a polynomial, if they are known, and the coefficients of that polynomial are two different sets of numbers that have interesting relations. If we know the zeroes, then we can write down algebraic expressions for the coefficients. Going the other way is much harder and cannot be done in general. A cubic function has a bit more variety in its shape than the quadratic polynomials which are always parabolas. We can get a lot of information from the factorization of a cubic function. We get a fairly generic cubic shape when we have three distinct linear factors. In the case of cubic polynomials, we get wavy curves of the kind plotted on this page. This cubic equation has real and unique roots at -14, 0, -20. 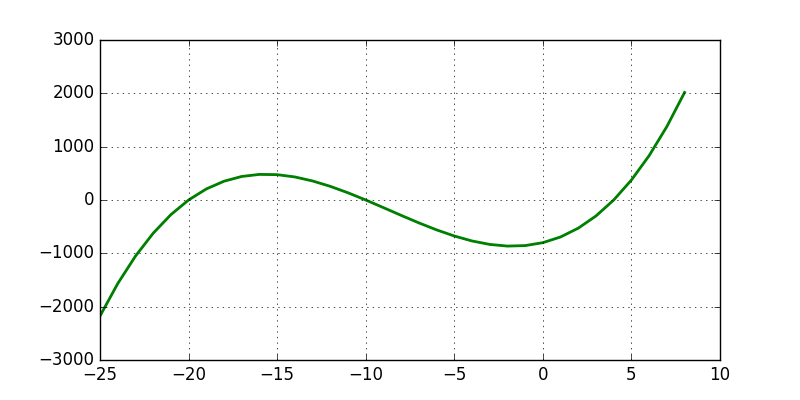 Coming to other geometrical features of this curve: The y-intercept of this curve is at y=0. And the second derivative of this curve becomes zero at x = -11.33. At this point the curve changes concavity. A cubic curve has point symmetry around the point of inflection or inflexion. This cubic equation has real and unique roots at 4, -10, -20. Coming to other geometrical features of this curve: The y-intercept of this curve is at y=-800. And the second derivative of this curve becomes zero at x = -8.67. At this point the curve changes concavity. This cubic equation has a double root at x = -20. So the plotted cubic curve has not only a zero for that value of x, but the first derivative at that point is also zero. A tangent to the curve drawn at that point will be parallel to the x-axis. 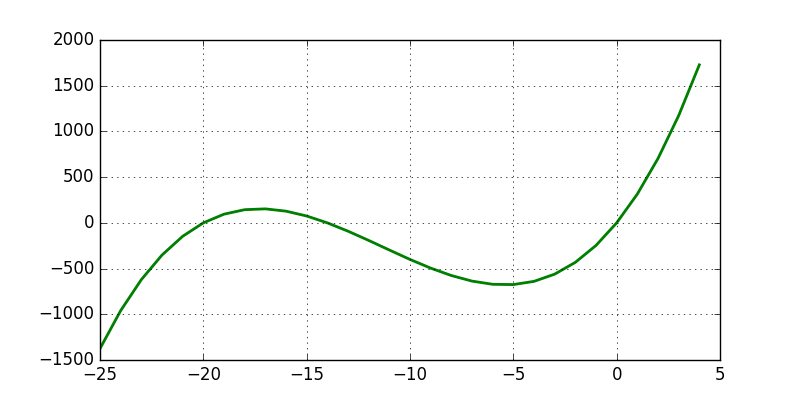 Coming to other geometrical features of this curve: The y-intercept of this curve is at y=-4000. And the second derivative of this curve becomes zero at x = -10.0. At this point the curve changes concavity. A cubic curve has point symmetry around the point of inflection or inflexion. This cubic equation has a triple root at x = -20. So the plotted cubic curve has not only a zero for that value of x, but the derivative and second derivative at the point are also zero. 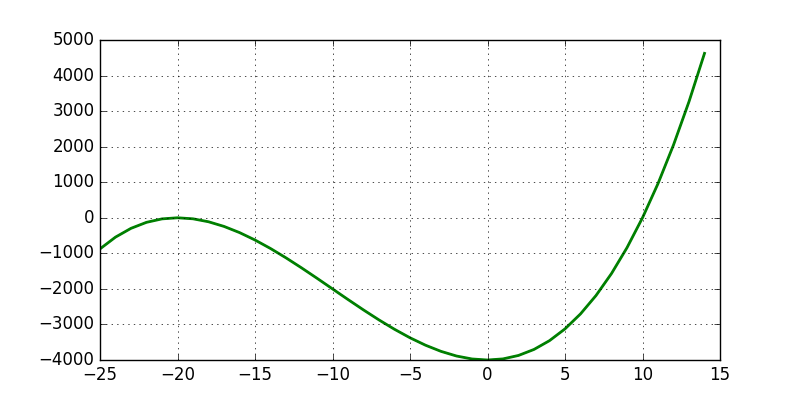 Coming to other geometrical features of this curve: What we see here is the graph of a nonlinear function. 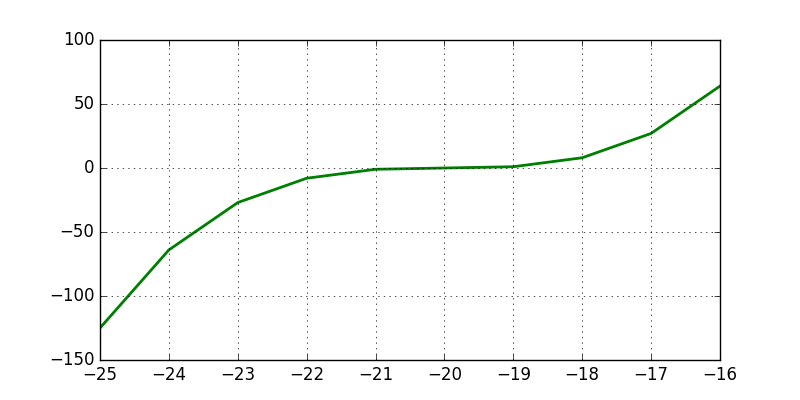 The y-intercept of this curve is at y=8000. And the second derivative of this curve becomes zero at x = -20.0. At this point the curve changes concavity. A cubic curve has point symmetry around the point of inflection or inflexion. These are just some of the important features and aspects to keep in mind while trying to visualize and analyze a plot of an algebraic function. A graphical and visual inspection helps in several ways. Here is a large number of cubic curves which you may study and observe. Curve sketching is an important requirement in many high school exams of Asia, UK, US - and is common, in ISC, IB, CBSE question papers, as well as entrance examinations like the IIT JEE. Curve sketching is a handy tool, used both directly and indrectrly in these examinations.